On Friday the 18th November our Chairman Tubby Peto, Musical Director Jennifer Westcott and Malcolm Allen attended afternoon assembly at Avalon School in Street. During the visit a cheque for £300 was presented to the school on behalf of The Brue Boys. 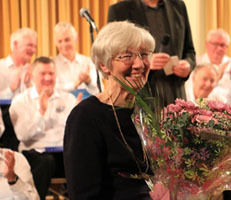 The assembly was taken by Alison McNamara, Assistant Head Teacher and the cheque was accepted by one of the senior pupils and members of the Ukulele Orchestra.The donation from the Brue Boys is to be used to buy ukuleles and music therapy sessions. We were privileged to listen to a performance from the newly formed Ukulele Orchestra. Since our beginnings we have helped concert organisers to raise £28,987 for their chosen causes and in addition we have donated £4,230 directly to various causes mostly to schools to promote music, but also to other organisations eg St Margaret's Hospice and Wells Palace Trust. So altogether the choir have raised a combined total of £33,217 leading up to our 10th Anniversary in January 2017. Thanks to the initiative of artistic director Trevor Ryder and other local Brue Boys, a Brue Boys Christmas Tree was decorated as part of the Keinton Mandeville Christmas Tree Festival which led up to an Advent Sunday Star Service. in the keenly-fought competition, perhaps boosted by BB own votes? in Keinton Mandeville on 20th December. The Brue Boys performed to a packed audience in St Mary's Church Huish Episcopi on Friday 11th November. 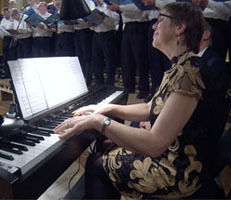 The concert raised £820 for Church funds and was the most successful similar event the Benefice has organised. See a report and photos on the 2016 Concert Reports page. in the Pays de la Loire, France. See Entente Chorale 2016 for a report. Our summer concert in Baltonsborough Village Hall featured the full 'Fantasia on British Sea Songs' by Henry Wood, famous for regular inclusion, in The Last Night of the Proms. See the 2016 Concerts page for more. We made our fourth appearance at the Royal Bath and West Show on Saturday 4th June when we gave two performances in the Bandstand. See the 2016 Concerts page for more. 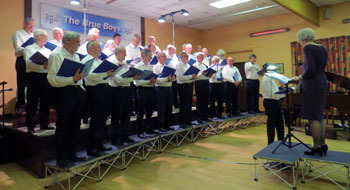 The Brue Boys provided a second concert for Shepton Mallet Rotary Club in Ditcheat Village Hall on Saturday 23rd April 2016 which raised £1264 for Kids Out and Somerset Young Carers Events. - more images of Edward Sherborne's photo-shoot on the News Archive page. Published by The Brue Boys Choir for Men Copyright © 2017 and all Rights Reserved.